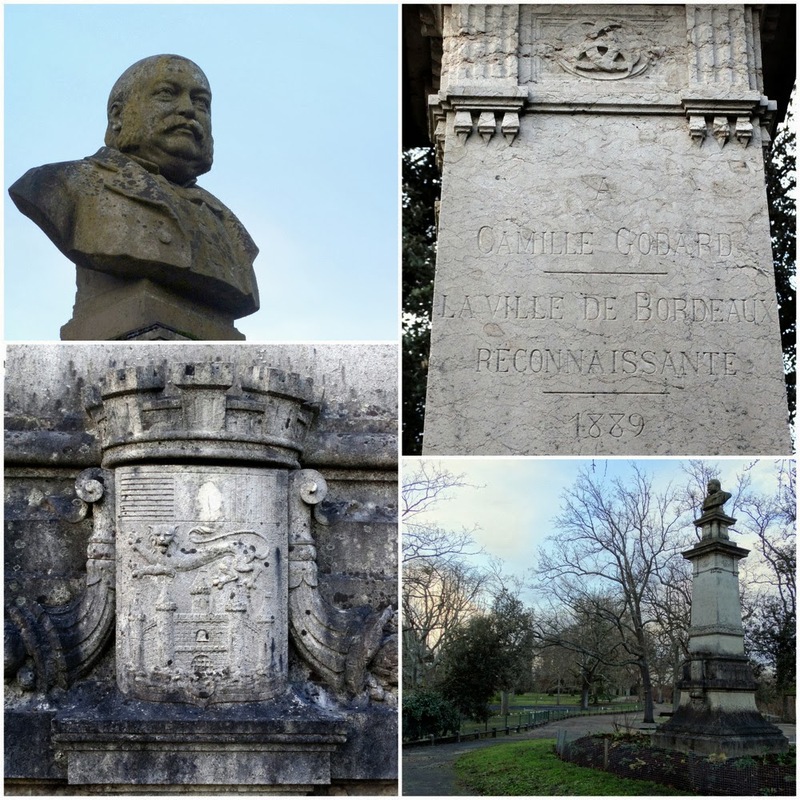 The city and people of modern-day Bordeaux owe much to the man celebrated by this monument which can be found in the heart of the leafy Parc Bordelais: Camille Godard. Sadly, very little is known about the man himself. After literally minutes spent on the internet and flicking through books I was only able to establish the following: Jean Baptiste Camille Godard was born in Cognac in May 1823 and died in Nice 58 years later in December 1881. His occupation was that of a “négociant”, a trader in wine and other produce, a position which is perpetually held in high esteem in Bordeaux. Négociants invariably carve out a status in the city’s high society and, above all, regularly become extremely wealthy. This was Godard’s case: with the fortune he had amassed, in 1855 he acquired the renowned Château Kirwan wine-growing estate in Cantenac, near Margaux. As well as overseeing the production of the château’s wine (which had just been ranked as a “Grand Cru”), Godard also designed its gardens – he was a keen amateur gardener and botanist. When Godard died in 1882, it also transpired that he was to be a posthumous philanthropist. 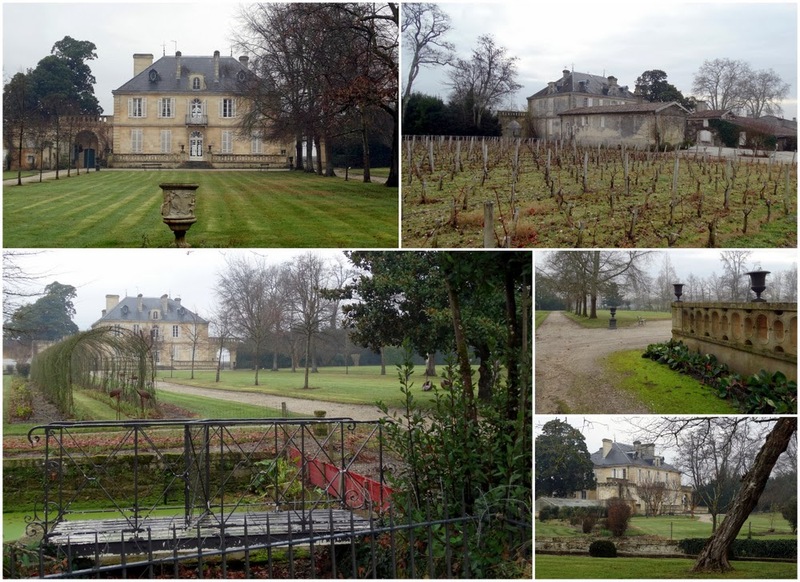 Château Kirwan and its magnificent Camille Godard-designed grounds (and vines). In short, Godard was officially committed to bequeathing his fortune to the city of Bordeaux and stated that investments would yield enough funds to enable the city to do things which were beyond its regular means. His request was that the money be used to build squares, embellish walkways, lay down roads, build schools, and initiate lessons, libraries and awards. His first wish was for the city to create a gardening school. Along with his money, Bordeaux inherited Château Kirwan itself. Management duties were handed over to the wine traders Schröder & Schÿler, until 1926 by which time partner Armand Schÿler bought the château outright. His family still owns the domain. The first venture facilitated by Godard’s funds was the purchase and landscaping of the Parc Bordelais. 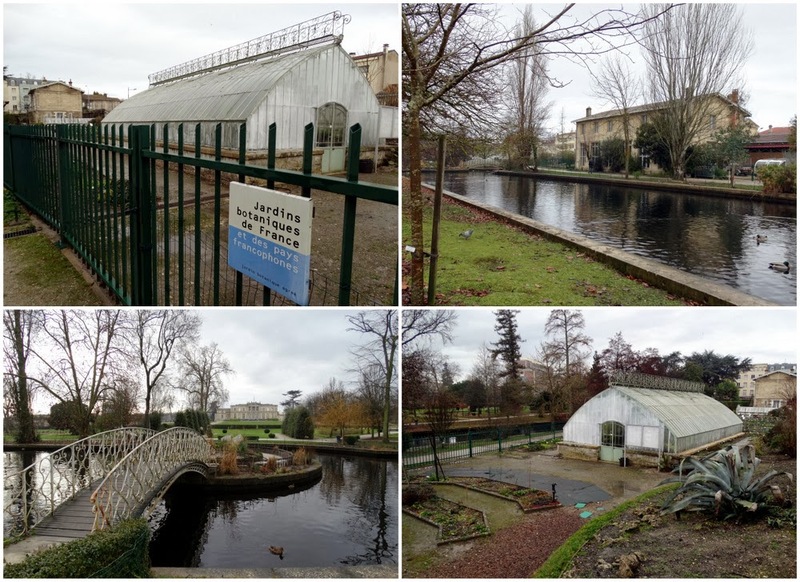 The area had previously been earmarked as the venue for a Paris-style “jardin d’acclimatation” but the project, led by a group of stakeholders from Caudéran (an independent town at the time) fell through. On July 15th 1882, Caudéran sold the plot to the city of Bordeaux on the condition that it would become a “lieu de promenade”, i.e. a nice place for a pleasant stroll. The park was officially inaugurated by the French president Sadi Carnot in 1888. A year later, the city of Bordeaux erected the aforementioned monument to its benefactor. The statue which can be seen today is the original marble sculpture (revealing a little further information about Godard: he was bald and sported a substantial bushy moustache). At the outset, a plaster copy had been installed but this was stolen in 1904. The decorative pedestal features the city’s coat of arms and three-crescent emblem as well as the words “la ville de Bordeaux reconnaissante” as a mark of the city’s appreciation for Godard’s generosity. The Camille Godard monument in Parc Bordelais. Godard’s request for a horticultural legacy began to take shape in 1890 when the funds were used by the University Faculty of Medecine to purchase part of the grounds of Château Peixotto in Talence. The resulting horticultural facilities, registered as botanic gardens which continue to be operated by Bordeaux University, comprise a two-storey orangerie, greenhouses and a laboratory. "Le jardin botanique universitaire de Talence", in the grounds of Château Peixotto, visible in the bottom-left photo. Later, in 1953, the city elected to use Godard funds to create his much-desired “école municipale d’horticulture”. After 13 years at one Château Carreire (located near Rue de Bethmann, the château was demolished in 1969 to make way for University Faculty of Medecine buildings), the establishment set up shop at Domaine Bel Air, a château in Le Haillan. The mansion had been built on the reported site of a battle during the Hundred Years’ War and had often changed hands up until the 19th century before being occupied by the Germans during the Second World War. Post-War the property was in poor shape until the city of Bordeaux purchased it and its surrounding lands in 1963. 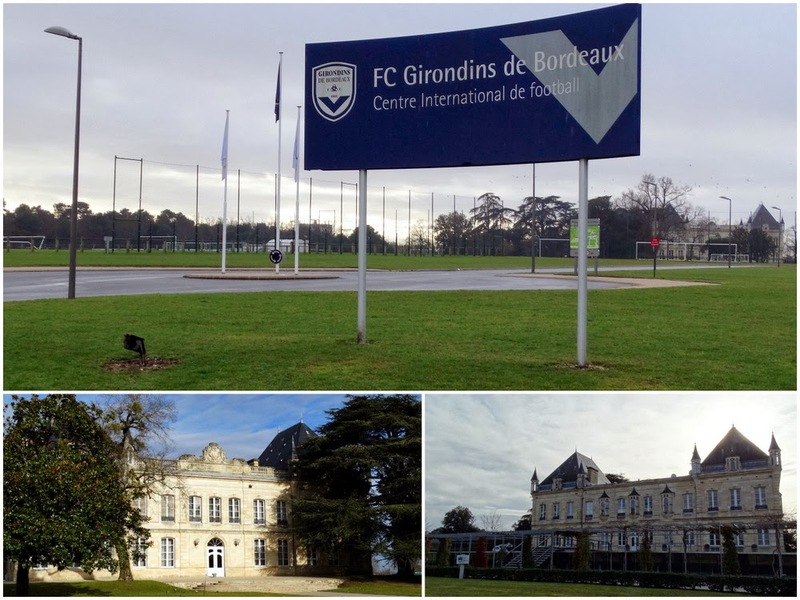 The horticultural college operated here until 1986 when the château became the headquarters and state-of-the-art training centre of local top-flight football team Girondins de Bordeaux. Now best-known as Château du Haillan, the mansion is surrounded by training grounds and facilities. The college, its greenhouses and its associated municipal teams of gardeners and landscape artists subsequently moved to grounds adjacent to the château and its football pitches. And that is where the facility continues to operate under the name of “Lycée Horticole Camille Godard”. The entrance to the modern-day Camille Godard "lycée horticole" in Le Haillan. Meanwhile, perhaps the best-known of the by-products of Godard’s wealth is, quite simply, the Monument aux Girondins, erected on the Esplanade des Quinconces in central Bordeaux between 1894 and 1902. The monument pays homage to the Girondins political group who were overpowered and executed by their rivals the Jacobins in the slipstream of the French Revolution. Its centrepiece is a 43-metre column which is topped off by a winged lady made out of bronze symbolising freedom (hence the broken chain in her right hand). 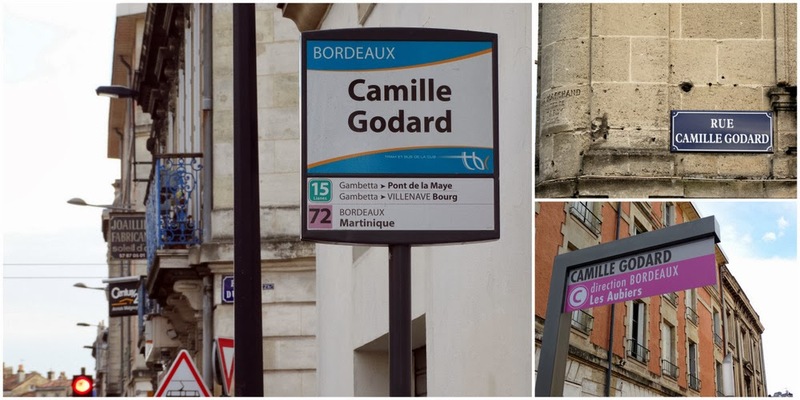 Signs of the city’s appreciation for Camille Godard’s generosity now stretch beyond the Parc Bordelais monument and include both a street and a combined bus-stop/tram-stop. So spare a thought for the wealthy benefactor the next time you’re on a number 15 or 72 bus, or on a Line C tram! > Locate them on the Invisible Bordeaux map: Find them: Château Kirwan, Cantenac; Parc Bordelais, Bordeaux; Château du Haillan, Lycée Horticole Camille Godard, Le Haillan; Monument aux Girondins, Rue Camille Godard, Camille Godard bus and tram stops, Bordeaux. > Thanks to Lesley Graham for clarifying some of the sketchier details about Château Carrière. Hello I live rue Camille Godard. It's very amazing to see all this pictures. I lived in Belgium-Brussel's until 2004, and since, I live in the wonderful city of Bordeaux. Excellent, thanks for that feedback and for hunting out this piece about Camille Godard! (...)Son père Jean Pierre Godard y était déjà lui-même négociant (source : A.D. Charente, registre cote 3E 108/31 vue 16). Camille Godard, qui s'était installé en Gironde et habitait alors Bordeaux, est mort à Nice, 26 boulevard Dubouchage. Son décès est déclaré le lendemain en mairie par un employé des pompes funèbres. L'acte n'est transcrit sur les registres bordelais, qu'un an plus tard, le 22.12.1882, acte n° 2348 ( A.D. Bordeaux section 2 cote 3E 284 vue 296/333). Thank you, and continue , this internet place is interesting and well made ! Thank you Colette for that interesting additional information, I have edited the article accordingly. In Bordeaux, many are familiar with Camille Godard's name but not necessarily the associated story!